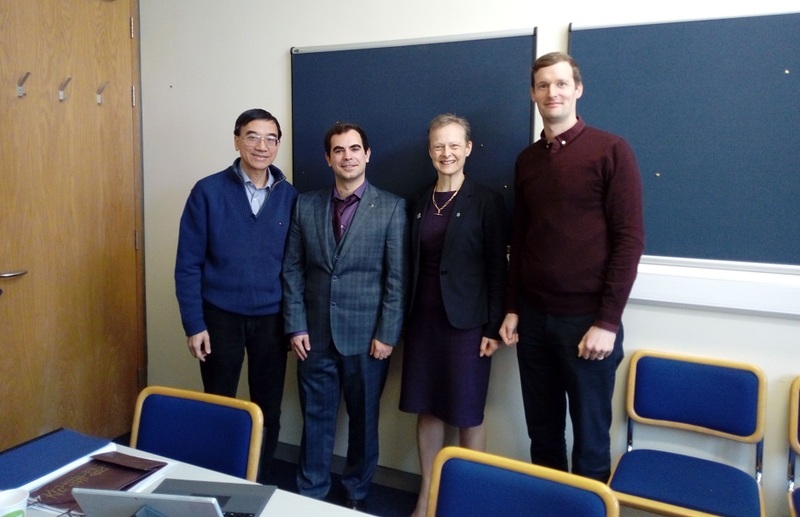 On Tuesday 19th March 2019, Daniel Martínez (ESR12) became the fourth TRUSS ESR in successfully defending his doctoral thesis in front of an examination panel appointed by the Postgraduate Committee at University College Dublin (UCD), composed by Prof. Francis Au (External Examiner from the University of Hong Kong), Dr. Daniel McCrum (Internal Examiner from UCD), and Associate Prof. Amanda Gibney (Chair from UCD). The thesis, titled “Bridge Damage Localisation using Displacements and Velocity Measurements”, was supervised by Prof. Eugene OBrien and Dr. Abdollah Malekjafarian from UCD. The defence was held in meeting room G99 of Civil Engineering in Newstead Block B. The VIVA was also attended by Prof. Eugene OBrien and Dr. Abdollah Malekjafarian. 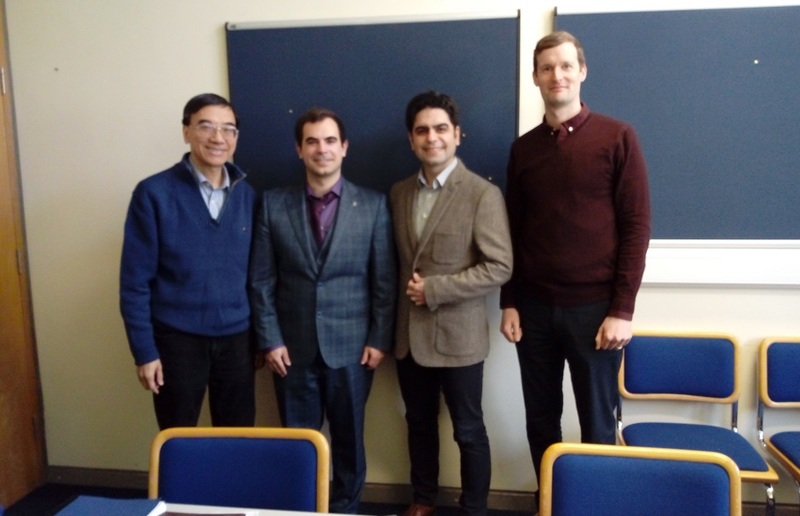 Following TRUSS, Daniel Martínez Otero started to work as bridge engineer for Atkins (http://atkinsireland.ie/) in Swords, Dublin (Ireland) in March 2019. This thesis considers two different strategies for bridge damage detection and localization using deflection and velocity measurements. First, curvature – the second spatial derivative of deflection – is proposed as an indicator of damage. The rate of curvature is also considered as this can be measured using Laser Doppler Vibrometers (LDVs). Curvature is proportional to the reciprocal of the flexural stiffness of the bridge cross-section. Consequently, a sharp increase in bridge curvature results from a local loss of stiffness, and indicates damage of the type associated with a bridge strike. The second strategy employs bridge deflection for the direct calculation of the bridge stiffness profile using the Theorem of Virtual Work. As deflection is usually calculated for a bridge with a known stiffness profile, back-calculation of the stiffness can be formulated as an inverse problem. As part of the first strategy, it is proposed here to measure curvature using sensors in a passing vehicle over a bridge (drive-by bridge monitoring). Instantaneous Curvature (IC) is investigated as a means of finding a local loss of stiffness in a bridge using drive-by measurements. Absolute displacements of a bridge cannot be directly measured from vehicle. However, it is assumed that relative displacements between vehicle and bridge can be measured. Difference Ratio is introduced as a damage indicator based on IC using relative measurements. These damage indicators compare the curvatures obtained from damaged and healthy bridges to find the damage location. It is shown that a sharp increase occurs at the damage locations. Vehicle-bridge dynamic interaction is modelled using the Finite Element (FE) method. Road profile and white noise are considered as the main sources of inaccuracy. A blind test is performed to test the ability of IC to detect local damage in a bridge modelled as a plate. By using Absolute Difference, damage is detected if the vehicle is calibrated prior to the tests. The use of LDV measurements taken from a specialist vehicle is proposed as an alternative for the first strategy. The use of LDVs is inspired by the Traffic Speed Deflectometer, a truck instrumented with several LDVs which is used for road pavement monitoring. In this thesis, the concept of using a Traffic Speed Deflectometer is explored for bridge damage detection. It is assumed that relative velocities between bridge and vehicle can be directly obtained from the LDVs. Rate of Instantaneous Curvature (RIC), which is the first derivative of IC respect to time, is introduced as a bridge damage indicator. RIC could be obtained using simulated relative velocity measurements. A Traffic Speed Deflectometer is modelled as a half-car using the finite element method. It is shown that, provided measurements are sufficiently accurate, bridge damage is detectable by comparing the RIC measurements from healthy and damaged bridges. Moving Average Difference is introduced based on RIC to make the method robust when noise is included in the measurements. It is shown that, in simulation, the damage location can be detected using the Moving Average Difference in the presence of noise. A novel method is proposed for the direct calculation of bridge stiffness from deflection measurements as part of the second strategy. It uses the bridge mid-span deflections and measurements collected from a Bridge Weigh-in-Motion system. A Bridge Weigh-in-Motion system provides axle weight and axle spacings of vehicles crossing a bridge. It provides an opportunity to use measurements from normal traffic passing over a bridge. This has the considerable advantage that measurement can be repeated every time a vehicle crosses the bridge. The relation between bridge deflection and stiffness is well known from the Theorem of Virtual Work. Hence the bridge stiffness profile, represented as a vector of point stiffnesses, can be theoretically obtained by solving an inverse problem using direct measurements of deflection. However, the inverse problem is ill-conditioned which means that the final solution is significantly affected by noise. Therefore, a regularization method based on the Blackman window is employed to address the ill-conditioning in conjunction with a moving average filter. Absolute deflection measurements at three fixed locations (close to mid span) are simulated and the influence lines found from every (simulated) passing truck are converted into a stiffness profile. This technique provides constant monitoring of the bridge and cracks can be detected after the passage of a thousand vehicles.